It is essential for an artist to remain open for inspiration. It can come in the form of visiting storehouses of great art, listening to great works of music or watching films seen a hundred times but somehow re-discovered again. It can come in a sun drenched rain shower, or in the laugh of a child in a crowded elevator. Inspiration may come from casual conversation, or as it happened to me recently, an innocuous sharing of a link, sent to me by Hans Elder, a friend and collaborator, with the short message, “check this out.” That is how I came across “Never Catch Me,” the Flying Lotus featuring Kendrick Lamar film directed by Hiro Murai. After watching the film I was moved to do three things: 1) Watch it again. 2) Share it with others. I didn’t want to share it the way people share video clips of dogs singing, kittens playing with tigers, or babies dancing. I wanted to interact with people, to ask them how the video impacted them. 3) Ask myself why it resonated so strongly with me. Rightly dubbed “ powerful, beautiful, upsetting and probably one of the best videos” of the year by Eric Decker of The Fader, I am still struck by the film’s haunting effects. That which we regard as art nudges the viewer towards closer examination. In the process it makes self-reflection a requirement. Am I moved by this visual poem because of its opening images of the two small coffins at the altar, in a church crowded with mourners? Is it the sight of the coffins freight: tiny, delicate brown-faced boy and girl immaculately dressed, lifeless and still? Is it the way the sadness, turns to exhilaration when the pair suddenly rise up and dance, a “lindy-hop” brilliantly choreographed by Keone and Mariel Madrid, imbued with a spontaneity that elevates the somber proceedings into a celebration of the spirit. Their moves shadow Kendrick Lamar’s vocals, as the dominant voice on the hip-hop landscape is ever present despite never even appearing on screen. 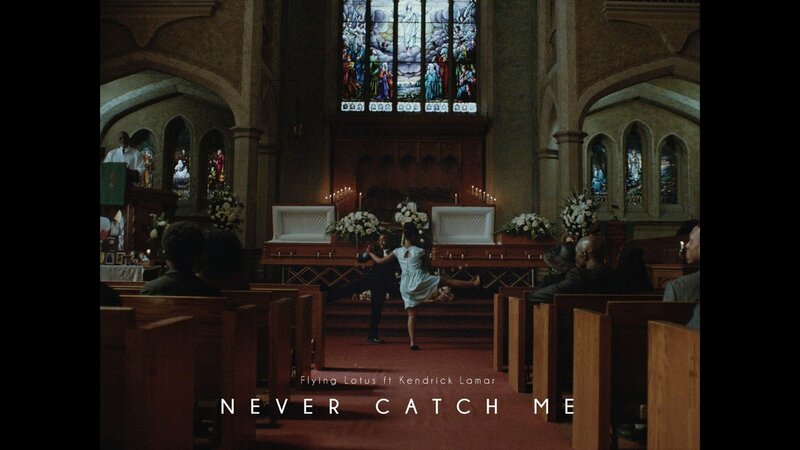 “Never Catch Me” reminds us of the eternal within, as it takes us on a trip of perpetual motion and unbridled child-like joy. However there is a darker side to the exhilaration. African-American children face enumerable perils to their very existence at an ever-increasing rate. Nightly news features a rogues-gallery of culprits, ranging from overzealous police, parental neglect or child abuse, gang violence, or other evils of poverty and communal petrie-dishes of generational hopelessness and desperation. We know the images, we can recite their names, and those of the grieving family members left to cope with unspeakable pain in the aftermath of a loss from which they will never recover. Communal grief emerges in still burning embers of rage, they march into our living rooms carrying signs on their tear streaked faces, chanting slogans in protest, offering little comfort other than solidarity and a vow that the tragic loss need not be in vain. Author and M.I.T. Historian Craig Steven Wilder, reflects on the film with brutal honesty after viewing it. “The film summons emotions that force us to confess that violence and marginalization have rendered the deaths of black children, routine and unremarkable.” Perhaps that is the most powerful aspect of the video: to remind us of the immeasurable value of the single precious life of an endangered species, African-American children, those who will not dance at their own funerals.